SINGAPORE -- China's reform and opening-up policies over the past three decades have not only greatly changed the country, but also contributed much to the development of world civilization, a Singaporean expert said in a recent interview. Zheng Yongnian, Director of East Asian Institute, National University of Singapore, said that China initiated its reform and opening-up policy in 1978 when the country was in a backward and closed or semi-closed state with its economy on the brink of collapse. The then Chinese leaders resolutely and courageously carried out the reform and opening-up policies, a critical step that has since shaped the course of development of contemporary China. The past 30 years have witnessed tremendous changes in all social aspects, with the mushrooming of new buildings and the freeing mindsets of the Chinese people, he said, adding that China has stood up and the Chinese people have regained their self-confidence. The policy of reform and opening-up has injected vigor and vitality into the nation, and has greatly promoted its economic and social development, Zheng said. Zheng attributed the success to Chinese leaders' political determination and willingness as well as the country's political system, which can and has mobilized the whole nation to reach its goal of modernization. The Chinese leaders, clear about the situation of the country, have the ability to adjust the policies to ensure the continuity of reform and opening-up, he said. The policies, in the fundamental interests of the Chinese people, have freed people's mindsets and boosted their initiatives. Zheng said that China has now grown into an open economy after the planned economic system was gradually replaced by a vibrant socialist market economic system that has basically taken shape. Hailing China's new mode of development, Zheng said the country has the ability to find a mode of development that is different from those of the developed countries and is benefiting other developing countries. The 30 years of reform and opening-up have helped China integrate itself with the global economic system, which, in return, has stimulated China to push forward its reform and development, Zheng added. Believing China's progress is a good thing for the whole world, he detailed that China had committed to prevent its currency from depreciation in 1997, while this time the Chinese government has pledged to continuously guard the stability of its financial and capital market in a positive and responsible way. 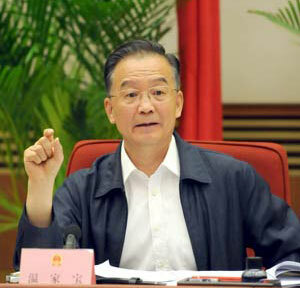 In Zheng's views, China is playing and will play a bigger role in regional and international affairs. "Nowadays, we can not see it as a world without China, We can not see a perfect development of regionalism and globalization without China, and nothing can work well without China's full engagement," he said. Zheng said that believes that peace and development remain the main trend of the world today, and the international environment as a whole is favorable to China's development. Now it is important for China to double its efforts to address such challenges as environmental pollution in order to maintain harmonious and sustainable growth for its economy, Zheng said. The service staff throughout the State sector simply did not have to make the gesture, much less crack a smile for customers. Though the characteristics of various marketplaces are different, Joseph T. Mallof stresses that he tries to focus on the similarities. Yang Yang devotes her adult life to helping those less fortunate. Her next events are star-studded affairs in Beijing tomorrow and Saturday, and promise to be her most successful yet. And every day, she is inspired by her grandfather. 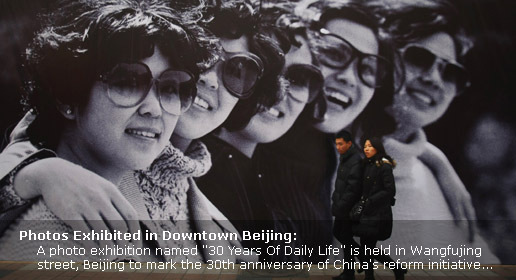 "Our thirty years", a themed photo exhibition showcasing the phenomenal transformation of China in the last three decades, recently opened to the public.